Do you have a plan? Do you know where to start your plan? Will your plan work? As with any form of marketing, there is no silver bullet. However, if you start with some guidelines and goals, your progress will be easier to monitor and adjust as needed. Additionally, by closely monitoring your social streams, you have an opportunity to create a more intimate relationship with your public. They will get to know your company and company culture and you have the opportunity to listen to their needs and concerns. Think you don't have time to get social? Webcentric Communications has that solution too! Does your appearance need to be formal and systematic? Or will your audience better relate to a relaxed atmosphere? Do you want to get people talking? Do you want feedback on your products? Do you want your public to share your content? You want your message to be consistent, but to show depth in your company, allow the administrators of your social channels to use their own voices. If you are handling your social media campaigns in house, it is often a good idea to pair up a marketing professional along with someone that is more social media savvy. Two sets of eyes are better than one. 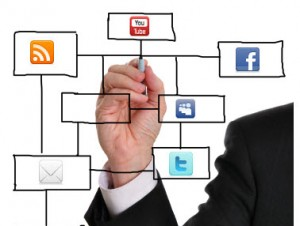 Contact Webcentric Communications for help in establishing and executing your social media marketing plan!